The valuable insights emanating from this book come from the witnesses of history themselves. 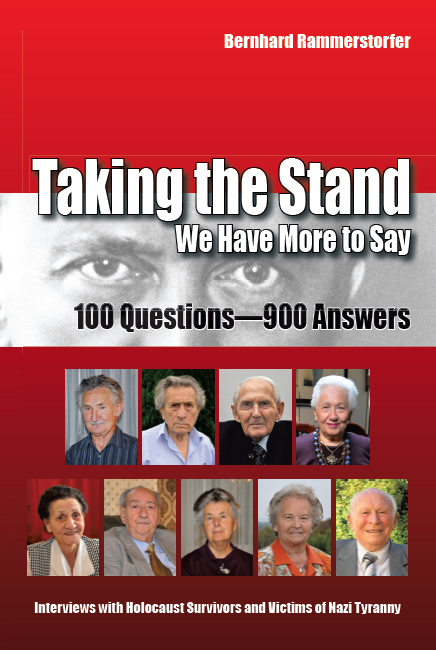 Over a period of five years, Rammerstorfer collected questions for Holocaust survivors posed by schoolchildren and students. Gathering 1,400 questions from 61 schools and universities in 30 countries on 6 continents, he distilled them to a set of 100 questions, unique in the world, which he used in the significant endeavor of conducting one-on-one interviews with nine individuals of widely differing experiences. The survivors are from five different countries and were persecuted for reasons of ethnicity, politics/ideology, or religion. All in all, they were interned in fifty-four camps or institutions. Some interviewees’ experiences have previously formed the backbones of award-winning films and include such notable individuals as Leopold Engleitner, Renee Firestone, and Adolf Burger. They are joined by international Holocaust lecturer Simone Liebster and Hermine Liska, and the nineteen year long imprisoned Richard Rudolph. His internment spanned most of the duration of Nazi rule and ten years under the East German Communist regime. Rammerstorfer coaxes deep from their vivid memories stunning and moving accounts of their encounters with the Nazi regime. Further, he has been able to draw forth their message to a younger generation that deserves to receive and value this legacy. 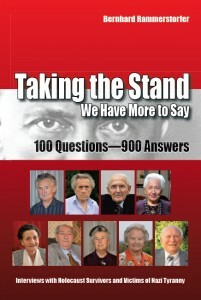 What is truly innovative about this book is that all the Holocaust survivors were asked the same questions. As a result, a point-for-point comparison of their answers is possible. The interviews nurture the uncovering of details and invite the victims to speak of their formative years and to describe their private family background; this genuinely caring approach encourages the spontaneous recounting of the most frightening moment for each victim and reveals their survival strategies. As survivors go on to tell further details, we are moved to respect and appreciate the people who were able to survive and found the courage to “take the stand” for our benefit. The valuable insights emanating from this book come from the witnesses of history themselves. Taking the Stand: We Have More to Say is a product of not merely one, but of many minds as these questions came from educational institutions around the globe. Available as Softcover, Hardcover, and eBook.